Give your gifts in style! 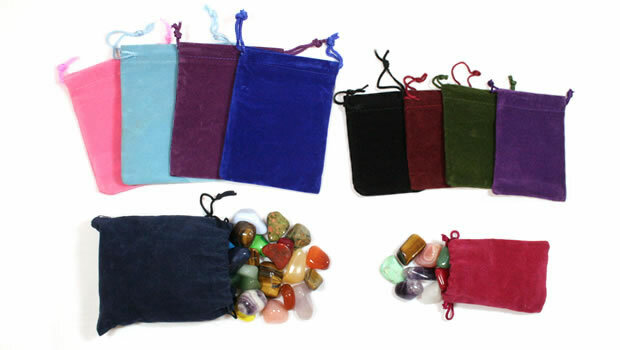 These velour drawstring bags are a great way to give a gift of tumbled stones - or other small items. A nice velour bag makes a small gift look extra special. These bags are also perfect for storing tumbled stones or other types of loot! Available in two sizes. Small bags are 2x3 inch (50x76 mm). Large bags are 3x4 inch (76x101 mm). Sold in bundles of five assorted-color bags. Tumbled stones not included. Polished stones can be a choking hazard for small children. If you are giving a small gift increase its appeal by presenting it in a soft velour treasure bag with a drawstring. These bags are perfect for giving a gift of tumbled stones or other small items. They are also great for storing your treasures in a soft protective pouch. Kids and adults love to prospect through tumbled stones, find a few "treasures," and take them home in a bag. Its a great activity for a faimly to share at the kitchen table during a holiday gathering. You get five small 2x3 inch (50x76 mm) bags that hold 10-15 medium tumbled stones or five large 3x4 inch (76x101 mm) bags that hold 40-60 medium tumbled stones (medium stones are between 3/4" and 1" inch in diameter). Sold in assorted-color lots only. Stones not included.